Rare war-date Revolutionary War enlistment Document Signed, 1pp. 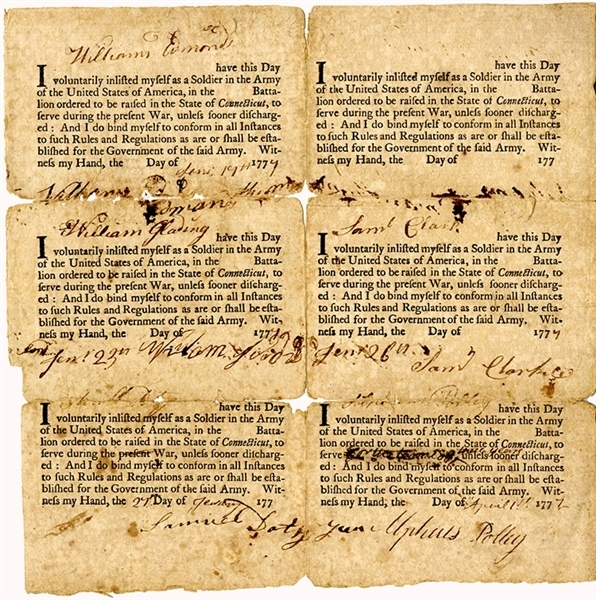 quarto, January 1777, Connecticut, enlsiting five (5) soldiers into the Connecticut Line, reads in part: “...I volunartily inlisted myself as a Soldier in the Army of the United States of America...And I do bind myself to conform in all instances to such Rules and Regulations as are or shall be established for the Government of the said Army...” and signed by soldiers William Edmonds, William Glading, Samuel Doty, Samuel Clark and Uphus Polley. Japanese tape on reverse at folds, else very good condition.